Australia Awards in Indonesia (AAI) provide selected scholars with the opportunity to obtain an Australian university degree, contributing to human resource capacity building and to Indonesia’s ongoing development. In addition, the experience awardees gain while in Australia – the “on-award” experience – is highly valuable in developing strategic networks and linkages with Australians and Australian organisations. More Indonesian alumni view their scholarship experience and Australia and Australians in general in a positive light. CAFÉ (Connection, Association, Friendship and Exchange) provides an opportunity to connect awardees with Australians from a similar professional background. This activity is best described as a peer-to-peer or peer-to-mentor scheme. While it is not an internship opportunity, it is anticipated that CAFÉ will provide mutually beneficial professional insights. In 2017, there are 150 participants in CAFÉ. 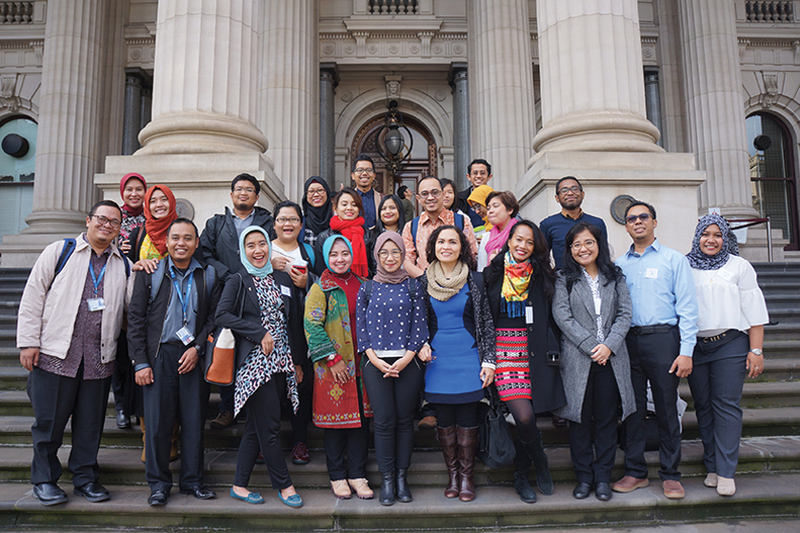 ILLA (Indonesian Language Learning Ambassadors) will connect participating schools with AAI scholars currently studying in leading universities across Australia. This program will provide AAI scholars with an opportunity to directly engage with Australian schools to learn first-hand about Australian culture, community and classroom teaching practices. Australian schools engaged in the program will improve students' knowledge and understanding of Indonesia through authentic learning experiences with an Ambassador. Selected Ambassadors engage with their matched schools assisting teachers with, but not restricted to, the delivery of Indonesian language and culture classes. SETARA provides scholars with an understanding of social inclusion which underpins much of the community debate which awardees will be exposed to during their time in Australia. In addition to broad issues of social inclusion, participants will also learn how gender awareness is incorporated into leadership and general policy-making in Australia. Following the delivery of the one day programs to awardees around Australia, BAGUS and SETARA Three Day Seminars will be available for selected scholars. Participants will travel to join other seminar participants and will spend three days developing further concepts discussed in the one day seminar series and to meet with key stakeholders to explore professional linkages and opportunities between Australia and Indonesia. Conference funding will be made available to selected AAI scholars on a competitive basis with an application round in March and July 2018. Applications will be assessed by Australia Awards in Indonesia in consultation where required, with the Department of Foreign Affairs and Trade and relevant external stakeholders. Key criteria in the identifying of the successful application will be the extent to which the application convinces the assessment panel of the relevance of the conference to the awardee’s studies, their home organisation and the opportunity presented by the conference to establish/enhance the awardee’s professional network. Maximum funding available is up to $1500 for awardees presenting at a conference and up to $1000 for non-presenting awardees attending the conference. In addition to conference funding for selected individual AAI scholars, opportunities will also exist to participate in a limited number of conferences as a group, led by a subject expert. In 2018, the selected conferences will be the Australia Indonesia Business Council conference (AIBC) and the Australian Council for International Development (ACFID) conference. This stream consists of a seminar series delivered separately by the State Governments of Western Australia, Victoria and NSW. These programs provide a professional development opportunity for selected scholars in these states. The seminar series will provide an insight to key state development priorities and will also include an opportunity to meet key state government officials and to visit key projects. Recognising the considerable scope for strategic professional linkages that exists between research scholars and Australian organisations, these two activities are designed to facilitate key contacts and to assist in the transition from research to policy. KAJIAN is designed to showcase AAI Doctoral scholar’s ideas and findings and to build connections between Indonesian research scholars in Australia and the Australian research community. The audience of interested individuals in the seminar include academic, public, private and non-government sector representatives, as well as fellow research students. KAJIAN offers an opportunity for AAI Doctoral scholars to make valuable connections with their research peers at the early and mid-point and final stages of their Doctorate. RIRI (Research Investment– Republic Indonesia) introduces Indonesian researchers to Australia’s approaches to research investment, addressing i) Why invest in research, and ii) How Australia invests in research. The activity will be a two-day workshop, where selected scholars will participate in a program of presentations, site visits, workshops and networking, facilitated by a research/governance specialist. Presenters will be drawn from the Australian Research Council, the Commonwealth Scientific and Industrial Research Organisation (CSIRO), the Australian Council for International Agricultural Research (ACIAR), the Australian National University and the Department of Industry, Innovation and Science. This stream refers to the relationship AAI has with a number of development organisations working in Indonesia and the opportunity this provides for scholars. In particular, our relationship with AVID (Australian Volunteers in International Development), ACICIS (Australian Consortium for In-Country Indonesian Studies), Asia Education Foundation and New Colombo Plan will provide opportunities for scholars to meet alumni from these programs in CAFÉ and other On Award Enrichment activities.